For parents of a certain age, the sound of summer is no longer ice cream van chimes or garden sprinklers. It’s the click of a key in the front door and the pulse of unfamiliar music from upstairs. Because, right now, thousands of UK students are returning from university to spend the next few months lounging round the family home — and, in the case of many recent graduates, there’s no certainty that they’ll ever leave again. The statistics paint an alarming picture for parents who were hoping to turn their child’s old bedroom into a guest suite. In the past 18 years the number of 20 to 34-year-olds living with their parents has increased by 669,000 — a 25 per cent rise. By last year, a huge 49 per cent of 20 to 24-year-olds were still living at home. Of course, it’s possible to blame the recession and lack of graduate jobs for such a comprehensive failure to launch. However, the main issue for parents welcoming back overgrown infants trailing clouds of laundry is often less economic and more emotional. And yet, while there are a thousand and one books, anecdotes and experts pouring forth advice on parenting babies, children and teenagers, the moment our offspring turn 18 we’re met with a resounding silence. My own son Wolf, 21, left home for university three years ago — and now he’s back for the summer. And while on paper I understand that he’s a grown-up, and that I have no control over his choices and behaviour, the urge to parent doesn’t go away. In fact, few could raise a beloved child to young adulthood and then abandon all responsibility as the smoke rises from the 18th-birthday candles. As a consequence, parents are left to negotiate an entirely new relationship with the heavy-drinking, sexually active chick whose legs are now dangling over the edge of the nest. At three am, the worst fears gather. I’d been awake for hours, and there had been no text from my son, no key in the lock. In my mind, he was unconscious on the pavement, his white-faced friends frantically scrolling for my number. Yet it wasn’t as if he was even due home that night – a few weeks earlier, he’d left for university, and my old certainty about where he was and with whom, had been replaced overnight by a continual low hum of dread. As a parent who had always been more Special Ops than helicopter, I had no idea how to stop worrying, and accept that I no longer had the power to keep him safe. That was three years ago- and I have had no choice but to get used to Wolf’s absence and accept that if he isn’t on Facebook for a full day, it’s more likely due to a hangover than a drive-by shooting. But it’s hardly been a case of waving him off to adult life, and then cheerily turning to my new regime of zumba classes and book groups, as most glibly supportive ‘empty nester’ websites suggest. Even if grown children don’t boomerang back, they may be travelling abroad, posting terrifying Facebook updates (“Can’t wait to try ayahuasca tonight!”), struggling with debt, drinking too much, or trapped in a dead-end job or relationship, far from the easy parental succour of lifts into town and bedtime chats. 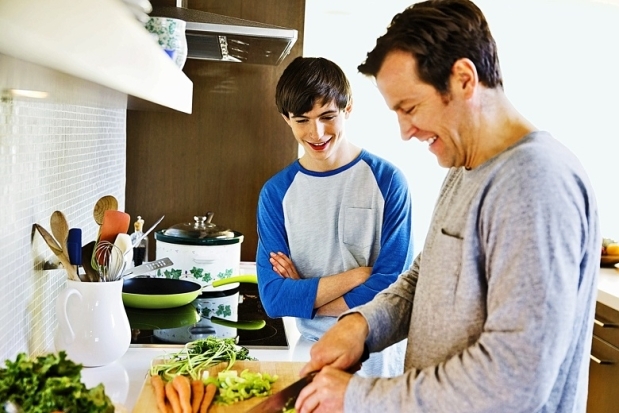 And yet, despite the inevitability of children growing up, there has traditionally been very little help for parents struggling with the transition — a problem that the psychology professor Jeffrey Jensen Arnett, the author of Getting to 30: A Parent’s Guide to the 20-something Years (Workman), aims to redress. While any drunk 16-year-old staggering in at 4am can expect a wild-eyed mother in a dressing gown to be waiting at the window, suddenly accepting that your grown-up child is bobbing over the horizon on a sea of cheap cocktails is tough. And whereas in the past parents were at least able to half-believe their child’s wholesome claims in irregular letters home, social media now means that the hovering parent is party to every party — however debauched — and there will inevitably be online photos featuring offspring passed out amid an exploded piñata of empty tequila bottles and fag packets by the next morning. I was relieved when my son allowed me to be his Facebook friend when he was 15 — I had no idea that six years on I’d be piecing together an alarming timeline of unwritten essays and lost dawns from his cryptic updates. Perhaps I shouldn’t be reading them — but at 21 is he truly a grown-up now, or does the fact that he still needs cash injections and comes home when things go wrong allow me a stake in his life? Arguably it does, says Arnett, who defines true adulthood by the triumvirate of “accepts responsibility for own life”, “makes independent decisions” and “becomes financially independent”. Even so, the idea of “flying the nest” is becoming increasingly redundant in an economy where a studio flat is an unaffordable dream for many twentysomethings. And, with more than a quarter of 20 to 34-year-olds now living at home and about 70 per cent still financially reliant on the bank of Mum and Dad, at least to some extent, adulthood is now unavoidably deferred — often till 30 and beyond. And, whether living together or not, it’s essential to accept that the rules have changed. “Friction is sometimes necessary between parent and child for separation to occur,” Herman says. In fact, the summer before Wolf left home, we had never rowed so much in our lives. At the time I found our sudden antipathy devastating — but in retrospect it was an essential step in letting go. If all parties agree, she says, there’s no reason why parents and adult children can’t all live at home happily — at least for a period. The biggest issue, however, isn’t who washes up, or curfew times. As I learnt, when my son and his long-term girlfriend broke up a couple of years ago, it’s when a grown child is in pain — and you can no longer cheer them up with a Disney DVD and a cuddle. Instead, the only possible option is to stand by, and let them know that you’re there if they need you. Witnessing my son’s pain was far worse than feeling it myself, and all I could do was buy him lunch, give him cash and dispense a few, probably useless, bits of advice. Standing by watching the child you’ve spent a lifetime protecting, nurturing and supporting make choices that are almost certain to cause them trouble is perhaps the hardest aspect of parenting. I look back now at my impetuous decision, aged 21, to drop out of university and get married, and I am staggered that my parents didn’t expire with horror. Instead, they allowed me and my wildly unsuitable husband to move in with them (“it’s only temporary”), did not throw me out when I found myself pregnant two months later, and brushed me down after the inevitable blood-soaked divorce by 25. I now realise that I was no grown-up at all — I was still working on forethought-free adolescent principles, without any experience to temper my decisions. And that may be the hardest thing about parenting an adult child — allowing them the chance to make terrible mistakes, and still being there when the consequences crash in. But when they inevitably do, perhaps that’s when their loving, anxious parents can finally begin to let go.